It’s been a busy week, chockfull of fun and activity interspersed with chatty meals and quiet times of listening as the grandsons practised their music. Now DH and I are packing for our trip up to Scotland and desperately trying to work out how to fit a quart into a pint-pot. At the worst possible time for us the speedometer cable on the very small campervan has given up the ghost and Peugeot seems to have forgotten how to keep supplies of spare parts readily available. We've been waiting for a replacement cable for over two weeks and it won’t be here until next week at least. This means that our new compact car now has to carry not only DH and me and what we need for a fortnight away, but also two leggy grandsons and all their clothes and games and musical instruments as far as Yorkshire. Wish us luck…. ….in the Transit household, hence my silence this week. Tomorrow their parents will bring our two older grandsons for their annual spring half-term holiday visit, so DH and I have been busy sorting out the house and planning what to feed them (a major task with hungry teenagers) and what to do with them. There has also been another development which is adding substantially to the activity levels. After a longer than expected wait I have received a date for my pre-surgery assessment, which will be on June 19th. Since we must be in France in early August for a family visit (arranged before the cataract saga even began) we have agreed with my helpful consultant that I can postpone the actual surgery until after our return from France. Suddenly the way is open before us for not only a couple of months in France (cherry time is approaching) after the assessment, but also a quick visit to Scotland to say hello to everyone and put the furniture back in place after last winter’s redecoration. So instead of simply taking the boys home next Friday and coming home, we will continue north in the very small campervan for a couple of weeks. If you don’t see me around much for a week or two, you’ll know the reason why. I’ll just be busy, busy, busy. Now all we have to do is hope that the weather for next week is rather better than the Met Office is currently forecasting. The eternal optimist – that’s me! To our enormous delight, our young hare seems to have taken up almost permanent residence in the former farmyard below the house. Except in the very wettest weather he has been back regularly for the past couple of weeks at least, usually for hours at a time. DH and I are amused to find ourselves automatically glancing out of the relevant windows to check on his presence or absence. This morning he was particularly active, grooming himself thoroughly before settling down for a nice long nap in the intermittent sunshine. Seizing his opportunity, DH eavesdropped on his morning toilette and in my first attempt at utilising all the facilities of YouTube, I've uploaded the result for the world to see. It’s short and silent and, we think, rather sweet. The ray of light in this gloomy situation is that the latest version of word verification is very much easier to decipher, so that even I can usually do it first time. This means that I can switch it on without feeling too guilty, until the spammers give up and go away. The sound you hear is Perpetua swallowing her principles and admitting herself beaten – for the moment….. This place is turning into Hare Central! 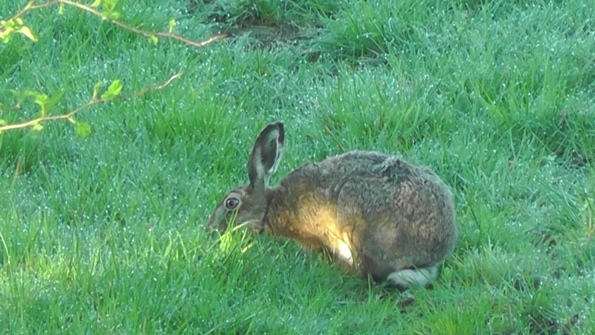 At about half-past seven this morning, DH looked idly out of the bathroom window and noticed that we had another visitor in the field below the house. It was definitely not the hare who took a nap near the house a couple of weeks ago, being noticeably bigger and stronger-looking. We watched with delight as he had breakfast, before loping casually round the corner of the barn and out of sight. 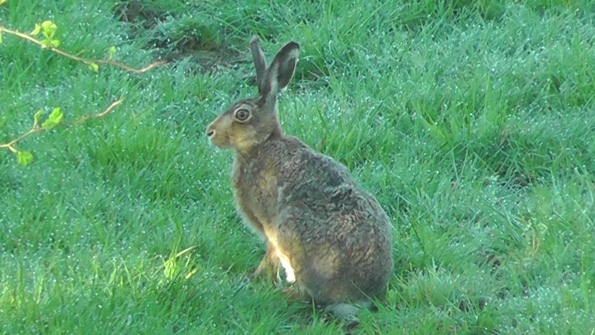 Two visits from a hare in as many weeks made our day from the very start. Sadly I doubt he has taken up permanent residence with us, but DH and I are thrilled to bits that he feels safe and comfortable enough to have spent a whole afternoon not ten yards from our kitchen window. Postscript: After much discussion and scrutinising of the photos, DH now thinks that the hare in the field in the top two images was a female as she was much bigger. The Hare Preservation Trust has confirmed in an email that in hares the female is bigger than the male. Our afternoon visitors (one or more individuals) were smaller and more probably male. So we have had at least two different hares visiting us, which is even more exciting, as we had yet another visit for a nap and a nibble the next afternoon. Gosh, that was a nice nap! Yes, I know that in the UK it’s a Bank Holiday weekend, but I have to grab my opportunities when I can. J Yesterday evening DH left for a three-day visit to his mother and this morning I leapt into action. Just as spring has been much delayed this year, so has my spring-cleaning. Normally I get down to it in February, when DH and his brothers have a family get-together, but this year the weather was so cold and miserable when he was away that I simply couldn't motivate myself to leave the fireside and venture into the chillier regions of our rambling house. But now the sun is making intermittent appearances and the temperatures are solidly in double figures, I have no excuse. So it’s down to work and out with the cleaning equipment while I have the house to myself with no interruptions. Today I had a practice run in my own study and am in fighting form for tackling the obstacle course that is DH’s office, before moving on to the rest of the house. Memo to self – don’t forget to clean beneath the fridge….